I haven’t been blogging much lately but I couldn’t miss this opportunity of telling you about GUADEC 2017 in the hope that it is going to encourage you to attend our next year edition in Almería, Spain. 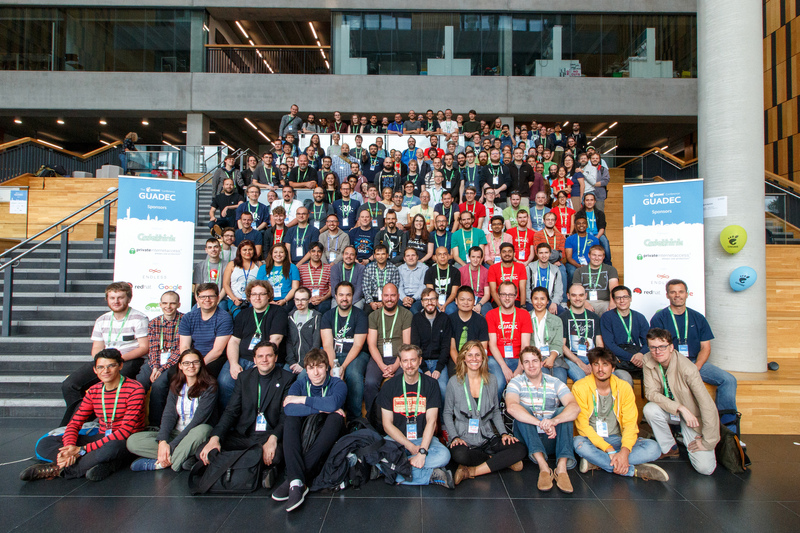 Looking back at the six editions of GUADEC that I have attended so far, I can honestly say that we are getting better and better, edition after edition. You might disagree but it is quite clear to me that we are evolving in a very promising direction as a software project and as a community (despite the political turmoil that our world is under). The GNOME Way has shined as a promising path towards a sustainable and progressive community, where “It is a rejection of technological elitism. It is an egalitarian version of openness” that enables us to move forward in an ethical way. This way I can guarantee that your attendance is going to be not only a pleasant but enlightening experience. In this edition, as always, we had an excellent selection of talks presented by our community members. It was extremely hard having to pick a talk when there were multiple ones happening simultaneously. My personal highlights are “Please Use GNOME Web” by Michael Catanzaro, and Christian Hergert rocking as always in his “State of the Builder” address. Later that day our former executive director Karen Sandler was keynoting “The Battle Over Our Technology” where once more Software Freedom was in the spotlight. After the afternoon brake, I chaired the sessions in the Hopper room, which gave me the opportunity to be part of the monetization discussions related to GNOME Software and Flatpak, presented by Jorge Garcia and Richard Hughsie. The activities of this room were closed by Julita Inca giving her reports of her outreachy activities in Peru. The whole conference day ended with our traditional Interns Lightning Talks. As someone who has been in the other side, I can tell who anxious one must feel of speaking in front of such a qualified audience. But the whole tension disappears in the air as soon as you see how receptive the GNOME community is to Newcomers and their projects. At day two I attended Jussi Pakkanen talk about meson, since I have been personally porting projects that I maintain into the build system, convincing me even more that this is a right choice. Unfortunately Nirbheek Chauhan couldn’t come, I hope his health is better now. This day I also watched Federico share his experiences of porting librsvg to Rust, and Carlos Garnacho talk about the future of Tracker. The main attraction of the day, IMO, was Jonathan Blandford’s “The History of GNOME” talk. If you’d have just 30 minutes to watch GUADEC talks, I would recommend this one. It was a zeitgeist of the last 20 years of our project/community with a good pinch of comedy and interaction with the living legends sitting in the audience. Matthew Garrett (I’m a big fan btw) attended GUADEC to share with us his expertise in security. And after it I jumped to Tristan’s Buildstream talk in the other room. After lunch I rushed into the conference room to see Tim Lunn talk about Ubuntu’s return to GNOME, since I have nothing but good hopes for both projects and mostly for the users of free desktops. Peter Hutterer traveled a long distance to tell us about mice! :p Followed by the GitLab conversation which sounded like a very promising closure for all the debates that took place before in emails and forums. I then hoped into the other room to watch Wim Taymans give a freestyle talk about his exciting experiments developing what we now call Pipewire. To end the activities in the Hopper room, Carlos Garnacho confessed the murder of GdkWindow in front of the audience. The lightning talks were the cherry on top! Other than the talks, we had social events which gathered us even closer by having beers and delicious food. A special highlight to the 20th anniversary party which was a fantastic surprise that got us all emotional and proud of our community. During the Unconference days I took advantage of being a few meters apart from people that I work daily through the internet to have more discussions and insights about the stuff we hack on. I would like to thank Zeeshan Ali for the counselling regarding the future of Boxes. All in all, I probably forgot to mention many other interactions and remarkable moments that I have experienced throughout the week in Manchester, but I guess you can figure everything else by reading all the other blog posts in Planet GNOME. Last but not least, I would like to thank my employer Red Hat for sponsoring my trip and the GUADEC organizers for an awesome conference. See you all soon!